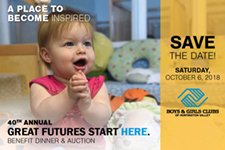 Join us on Saturday, October 06, 2018 at the Hyatt Regency Huntington Beach Resort and Spa for our largest fundraising event of the year, the Annual Benefit Dinner & Auction -- "GREAT FUTURES START HERE.” An extensive silent auction, entertainment, dinner, and a live voice auction are all part of this amazing event that you don't want to miss! Surf City Rotary Club of Huntington Beach will once again host its "Surf City Splash" event on March 9, 2019 at the Waterfront Resort, a Hilton Hotel. This fun evening will include an auction, dinner, and dancing. Boys & Girls Clubs of Huntington Valley is proud to be Surf City Rotary's 2019 "premiere charity." Proceeds from "Splash" will help build a new Club right on the campus of Golden West College. On May 15, 2019 at the Mile Square Golf Course in Fountain Valley, JMG Security Systems, Pacific Premier Bank and friends will once again express their support of the Boys & Girls Clubs of Huntington Valley by hosting the 24th Annual Benefit Golf Tournament. Last year's event raised $110,000 for our Club's award-winning programs and services - the tournament's most successful year yet! Click "Learn More" below for details on this year's event. Strike up some fun with the Kiwanis Club of Fountain Valley at the 9th Annual Pins for Kids Bowling Tournament! This entertaining event will take place at Fountain Bowl on August 4, 2018. You can help by signing up a foursome of bowlers or by donating items for the event's opportunity drawing and auction. Interested in participating in 2018? Click here for information about how to sign up or donate items for the raffle.